On Saturday, October 4, Fermilab hosted nearly 30 rocket launches. The Fermilab Association of Rocketry (FAR) had its monthly club launch at the southeast corner of Eola and Batavia Roads, with strong winds that carried parachuting vehicles far from their launch pads. The next FAR meeting and building session will be at 5:00 p.m. on October 15 in the basement of the village barn. FAR members are also involved in the second annual Team America Rocketry Challenge (TARC), which is sponsored by Aerospace Industries Association and the National Association of Rocketry. The contest invites teams of middle- and high-school students to build two-stage model rockets from scratch and launch two eggs to a prescribed altitude. The eggs need to land on the ground without breaking. FAR encourages the children of Fermilab employees to participate, and FAR members offer to serve as mentors. Registration ends November 15. The wit and humor of Gilbert and Sullivan come to Ramsey Auditorium on Saturday, October 11, at 8 p.m. as Opera A La Carte performs staged and costumed highlights of some of the most beloved operettas, including The Mikado, H.M.S. Pinafore, Patience, The Pirates of Penzance, and other favorites. Opera A La Carte is a first-class professional production company specializing in Gilbert and Sullivan. Founded in 1970 by noted British Gilbert and Sullivan scholar and artist Richard Sheldon, this company has enjoyed a remarkable rise to fame. Known for the authentic style of its productions, the company is constantly winning new audiences through its nationwide tours and is acclaimed as the foremost Gilbert and Sullivan touring repertory company in the country. It may be 10 years late, but the Superconducting Super Collider (SSC) has finally found a literary champion. It's Herman Wouk, the Pulitzer Prize-winning author of The Caine Mutiny and a master of historical fiction. Still productive at 88, Wouk has made the SSC the focus of his latest novel, A Hole in Texas, due out next spring. "My longtime friend, Glenn Seaborg, used to ask me when I was going to write a novel about a scientist," recalls Wouk. "Well, A Hole in Texas is my shot at the target." To prepare to write the book, his 12th novel, Wouk toured the SSC carcass in Waxahachie and met with scientists at Illinois's Fermilab, home of the world's most powerful accelerator. "For years I've thought that there is a great story in the interface of science and politics," he says. "The SSC seemed like a good way to tell it." The top quark, the heaviest elementary particle, was discovered in 1995 at Fermilab's DZero and CDF experiments. Our understanding of it is limited. For example, we don't understand why it has the mass of a gold atom, and why it is about 40 times heavier than any other quark. It might well be that the top quark plays a special role in the mechanism which gives elementary particles their mass (electroweak symmetry breaking). Therefore, a detailed study of the top quark might give us a hint on a number of unsolved puzzles in the present understanding of the microcosm. Preliminary D� measurement of the production rate of top quark-antiquark pairs from Run II data, presented at the Lepton-Photon '03 conference at Fermilab. in the standard model. Our preliminary measurement indicates a slightly increased production rate compared to the Run I measurement, which was predicted due to the increased proton- and antiproton beam energies during Run II. 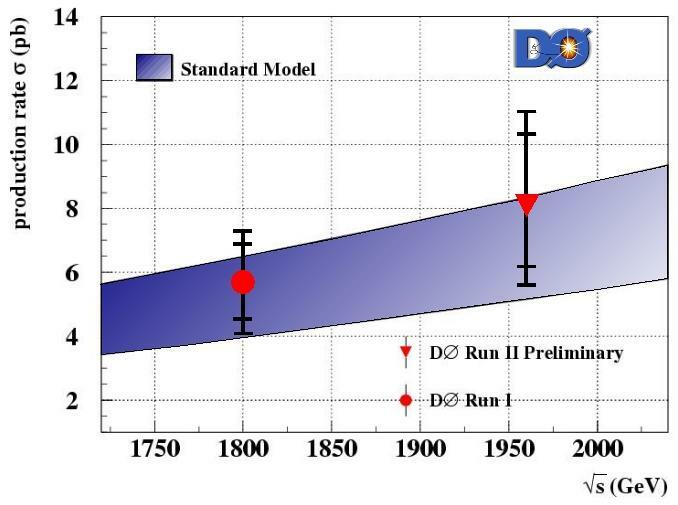 As we continue to accumulate more data, and improve our understanding of how to get the most out of the upgraded D� detector, we expect to significantly improve the precision of the production rate measurement in the next months. We will also test top-quark properties such as its mass, electric charge, spin and its electroweak production mechanism. Marumi Kado (left) from Lawrence Berkeley National Laboratory and Bob Kehoe (right) from Michigan State University are coleading DZero's effort to measure the top-quark pair production rate and are working on the DZero calorimeter. There will be a site wide power outage on Monday, October 13 from 7:00 a.m. to 7:30 a.m. The entire site, except for the village, will lose power during this thirty minute time period. It is recommended that you shutdown your computer before leaving for the weekend. To give employees an opportunity to learn more about the many different facets of Fermilab, the Education Office introduces the "Cruisin' the Lab" lunchtime series. The kick-off will be Tuesday, October 14, at noon in One West with the video "Fermilab Stories." Complimentary popcorn and soda will be provided.